Photographed on the Saturday 19 March 2016. 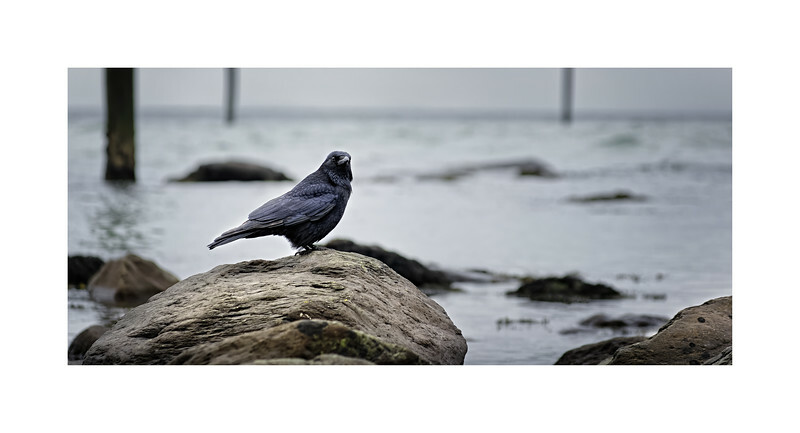 The crow belongs to the bird family or Aves (avian). They are vertebrates belonging to the Chordata and known as ‘avian dinosaurs’. There are about 9 956 species of birds in the world of which about 574 occurs in the UK. Fossil records indicate that birds are the last surviving group of dinosaurs having evolve from the theropod group of saurischian dinosaur ancestors. They are characterised by light hollow bones which contain many chambers or large air-filled cavities that was typical of the dinosaurs. The crow (Corvus corone corone) belongs to The Phylum Chordata, Class Aves, Order Passeriformes (passerine _ able to perch), Family Corvidae and Genus Corvus. The image here is of a Carrion Crow (Corvus corone corone) it is all black (but actually gas green and purple iridescence as well) and makes a hoarse, cawing sound. Carrion Crows make big nests out of twigs, rags, bones, and anything else they can find, which they hide in tall bushes; they do not nest in colonies like Rooks but are mostly solitary. Carrion Crows are birds of farmland and grassland, but are extremely adaptable and will come to gardens for food, often seeming to be quite fearless. They feed on carrion, invertebrates and grain, as well as stealing eggs and chicks from other birds' nests. Although now classed as a separate species to the similar Hooded Crow, Carrion Crows can interbreed with their cousins, and hybrids occur where their ranges cross. The genus includes various races of the crow such as the hooded crow as well as rooks, jackdaws and ravens. Crows are considered to be amongst the world’s most intelligent species, capable on not just using tools but also constructing tools and counting beyond the number two. Some ravens have determined to be capable of counting up to eleven. Crows and other corvids are steeped in folklore and myth in part probably due to their intelligence.